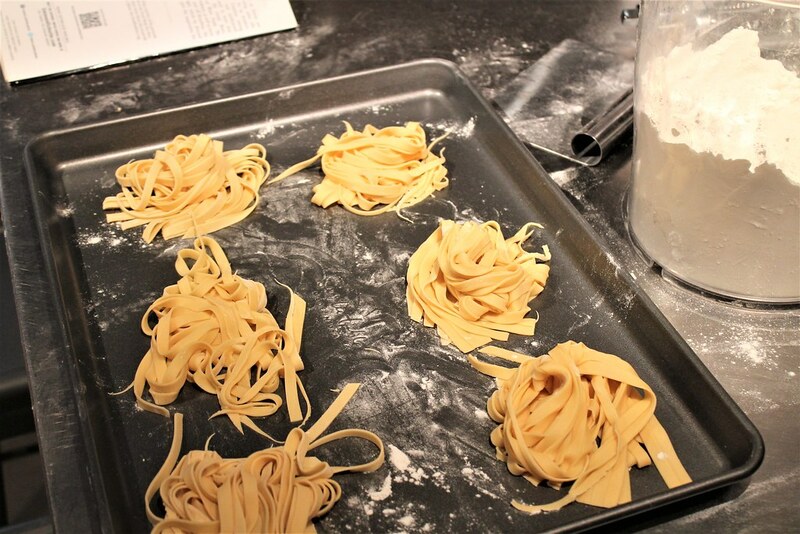 Within minutes of our first attempt at making fresh pasta, I found myself proclaiming passionate promises of only using fresh pasta from now until forever in my kitchen. When all was said and done, the sentiment still held true, however, reality put the hope of forever fresh pasta into perspective. *Though it is fun to make if you have nothing better to do**. **Let me rephrase that, because it sounds pretty awful that way. It is a fun activity if you and a friend want to spend several hours bonding over potato dough. 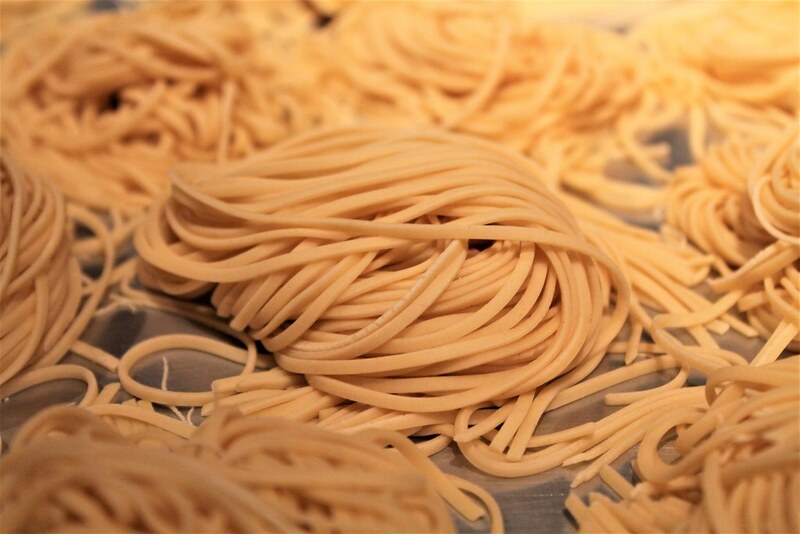 When compared to gnocchi, fresh pasta is a cinch. However, similar to gnocchi, the product yielded from what felt like a massive dough round is rather small. Making the dough, especially when compared to gnocchi dough, is insanely easy. The issue we met was settling on what recipe to use. Every recipe we found had a slight difference from the next whether it be a combination of flours, one less egg, etc. After making two and carrying them both through to the end, I think next time we will settle on our own variation. 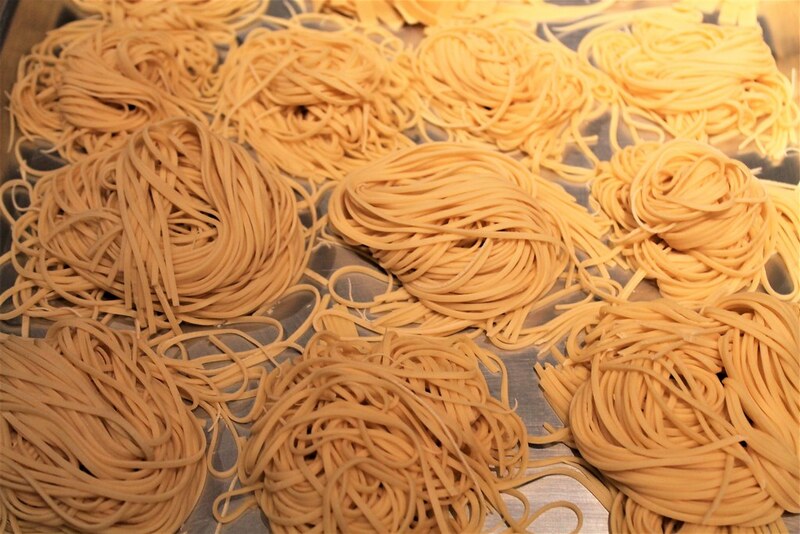 A good thing, but also perhaps bad, about rolling out pasta is that it is repetitive. It almost becomes repetitive in an I-think-I’m-going-crazy-I’ve-done-this-so-many-times way. Back and forth from table to machine, making sure the dough isn’t too sticky, folding the dough, back and forth, back and forth, back and forth! But when it was ready for cutting…wow! Even though I knew this was the expected final result, actually seeing real pasta, that had minutes ago been only flour and eggs, was pretty fascinating. 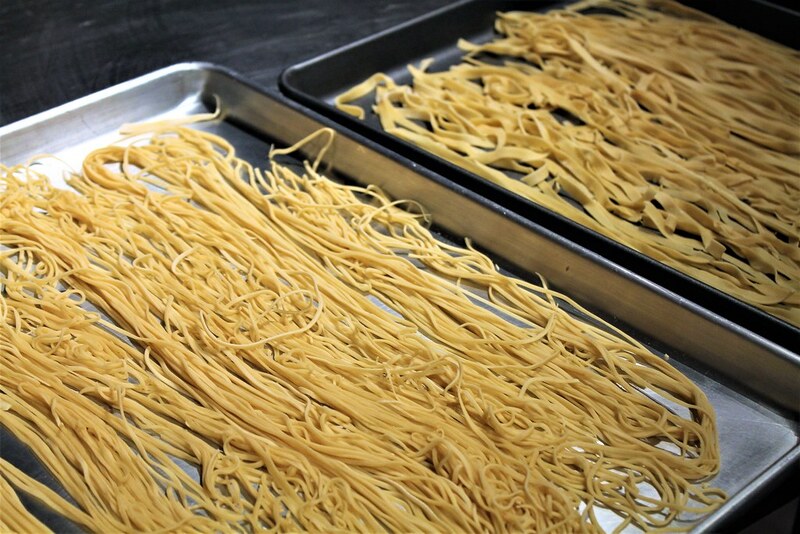 The only issue we ran into after cutting our pasta was that, although in all the fancy restaurant pictures fresh pasta is seen set in piles as pictured above, it actually needs to spend some time laid or hung in its individual strands in order to dry. 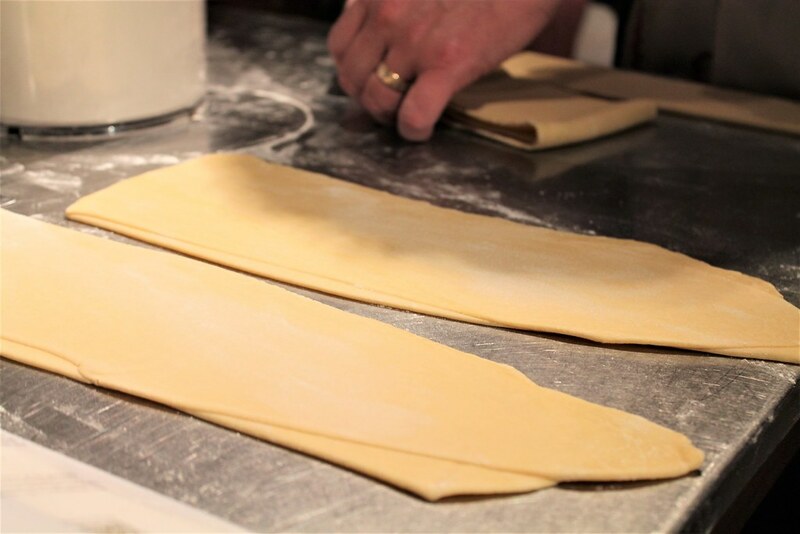 Otherwise, you’ll meet strands that have fastened themselves back together into a blob of dough. Which, you can imagine, does not cook very well. One recipe we used was from The Tucci Cookbook written by Stanely Tucci. 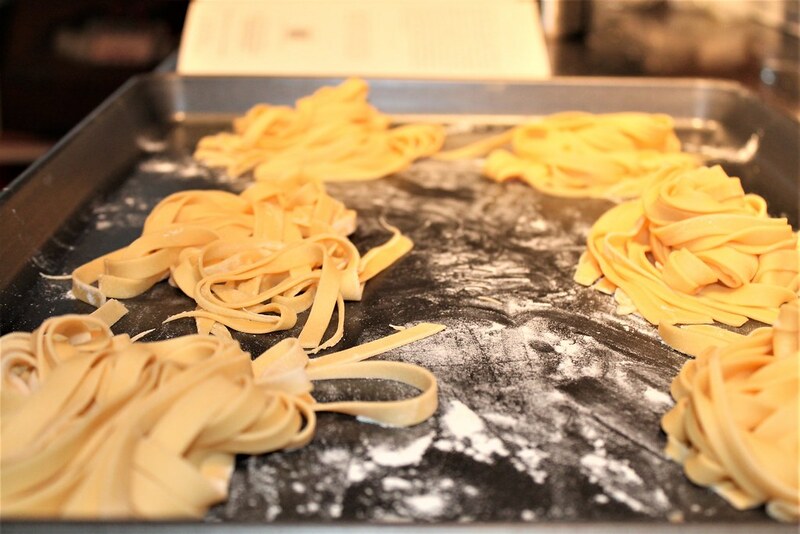 He describes his mother making fresh pasta and laying it out on a clean bed sheet to dry. Sounds like she made a lot of pasta at once. 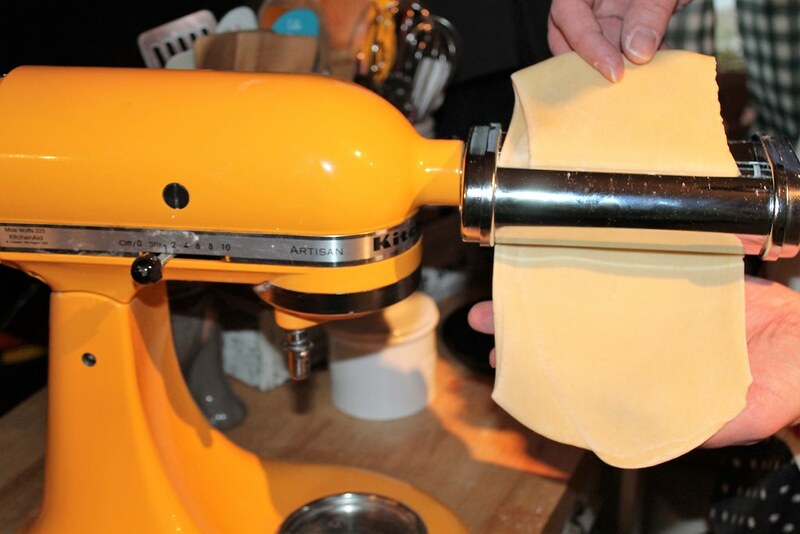 They do, fortunately, sell pasta drying racks to aid with this part of the process. Hopefully by the next time we make it I’ll have purchased one.